If I ask you, who developed and sold one of the first commercial digital cameras, what would be your answer? Fuji? Kodak? Maybe even Canon? What if I told you it was Apple? Don’t believe me? Well then let us rewind the clock to 1994. Tonya Harding had just won the national figure skating championship only to lose it later after attacking her rival Nancy Kerrigan, the channel tunnel finally opened, linking England and France and the people of Los Angeles were recovering from the Northridge earthquake, one of the costliest natural disasters in U.S history. In tech news, the Java programming language saw it’s debut release and Netscape Navigator was rapidly becoming the most popular web browser. While all of this is happening, Apple, under the leadership of Michael Spindler, was branching out from the computer market. During the mid 90s, Apple had begun to research and design such products as the Apple Emate, the Apple Newton and Quicktake camera. 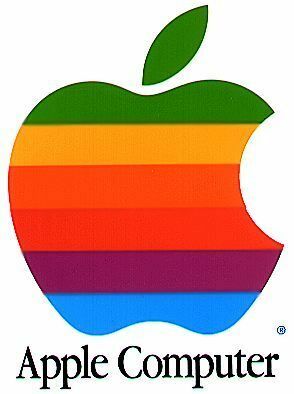 It also saw Apple giving the green light to companies to make clones of Apple computers, something unheard of when still under the direction of former CEO Steve Jobs. When the Quicktake was initially released, I didn’t have the pleasure let alone the money to afford one. Priced at over £700 it was a little out of reach for a 16 year old still in school. 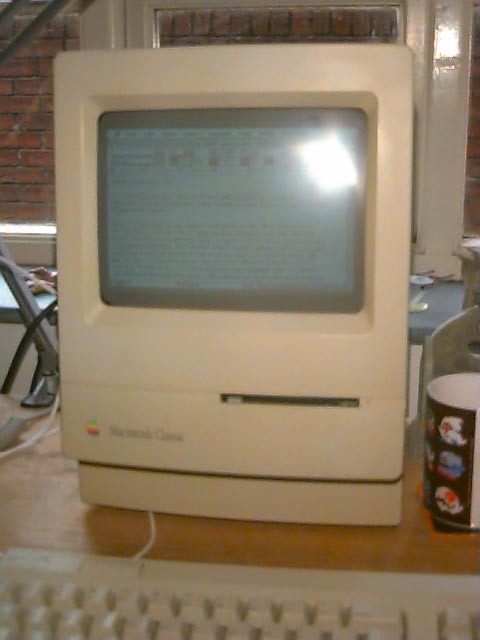 However, now in 2013 they are a little easier to come by and thanks to my friend Mark, who was kind enough to donate a Quicktake 100 and 150 to ByteMyVdu, I finally have the chance to try out the innovative piece of 90s tech and feature it on my site. Aesthetically the 100 and 150 look the same, however, the 150 was released later, in May 1995, a year after the 100 debut. 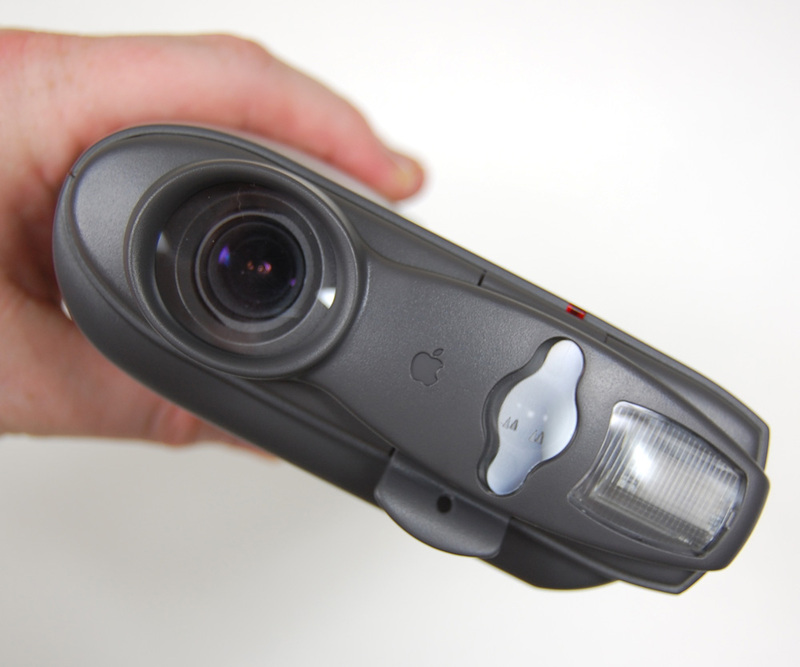 At which point, Apple had developed a firmware upgrade for the Quicktake that allowed the 150 to hold double the number of pictures of the 100, which was limited to only 8 24bit 640×480 images in high resolution and 32 in 320×240 low res. In addition, the 150 came with an lens attachment that allowed the camera to take macro shots when clipped over the front of the camera. As both cameras where externally the same, the QT 100 owners could make use of the macro lens also. 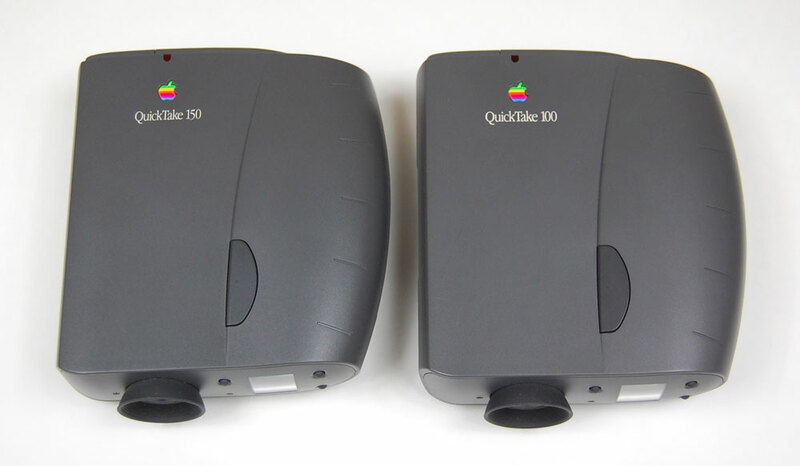 Apple offered a factory upgrade service to all QT 100 owners, changing the name to Quicktake 100 Plus, giving the camera all the abilities of the 150. The 150 also differs in the ability to save images in the additional file formats BMP, JPEG, PCX, TIFF. Where in the 100 can only save in Quicktake and Pict image formats. For the past month I have tried to use the QT150, carrying it around with me in my bag. I have tried to use the camera in practical everyday situations. The experiment has certainly turned up some interesting results, one of which was the size of the camera, for 1995 I’m sure the Quicktake was pretty compact. But in 2013, this once technical innovation is looking a little bulky, especially when sat next to my smart phone, something that has more processing power than a 90s computer along with a 5 mega pixel camera. Technology moves fast and I am amazed how it has advanced in 15 years. The same is true if you compare computers of the 80s to those of the 90s. I have to admit, I was impressed how well the Quicktake’s 0.3 megapixels sensor performed, even after 18 years. Admittedly it will never match my Canon EOS 30D or even my phone for that matter, but for internet purposes the Quicktake is actually a useable camera. If you are looking for amazing high definition, you simply won’t find It with this 18 year old camera. I doubt you could use a Quicktake today without getting slightly annoyed with the restrictive and rather basic controls. I discovered this when I tried to manage the images I had taken. Unlike more modern cameras, the QT will not permit you to delete individual images, so deleting images you’re unhappy with isn’t an option. Instead you can erase the entire memory, which is a little overkill in my opinion. I really do question the reasoning that led the designer to think this was what consumers would want, instead of letting you delete the most recent images in sequential order, which to me makes more sense. 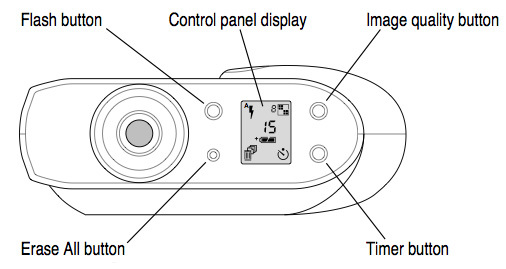 I can only assumed it has something to do with the constraints of the hardware inside the camera. It could easily be a restriction of the flash memory, but it’s anyone’s guess really. The Quicktake line of cameras still has a following even today, mostly by camera and Apple enthusiasts. While it will never compare to your iPhone, you are certainly more likely to be noticed taking photos with the Quicktake. For a bit of fun, the Quicktake is well worth getting if you are a collector of retro hardware. The Quicktake uses an Apple serial mini din cable to link it to your computer. Today it is very hard if not impossible to find a serial port on a modern computer. Luckily you can buy usb to serial adapters which can make the process much easier then digging out that old 486 IBM from the garage. The one hurdle you might face is if you plan to use your Quicktake on a Windows PC, as I did. Unlike connecting to an Apple computer that uses the same mini din connection at both ends, the PC uses an RS-232 interface, that is not compatible. You will need to find suitable mini din to rs-232 cable or make one yourself, luckily the latter is easier then you might think, thanks to the author of MyriadOfThings.com, who has been nice enough to write a guide explaining in easy to follow steps, just how to build your own cable. I highly recommend you check out Erik’s site, as he has a wealth of fun info and articles on his site. 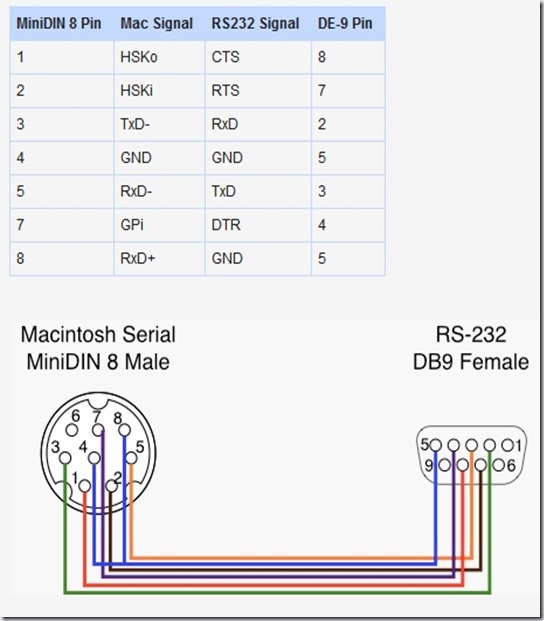 Below is the wiring for making your own cable, click to enlarge. Snapping a photo on the Qt150 of my blogging essentials. For the time, I can honestly the say the Quicktake must have been an impressive camera. I recalled my father owning a Casio digital camera around the same time and the photos were never as good as those I have taken with the QT 150, which really makes me wonder why the Quicktake didn’t take off. For what ever reason the Quicktake was not very successful and ultimately the product was discontinued when Steve Jobs returned to Apple. Quicktake has been a nice trip down memory lane and it’s certainly easy to understand why the camera is still popular with Apple fans. While I might not wish to replace my Sony Mavica just yet, I still won’t let that stop me from taking the Quicktake out for a stroll now and again. After learning recently that my Yam guide had failed a fellow Amigan, I have decided to get the proverbial finger out and cover setting up email more thoroughly. If anyone has any questions or would like me to cover something specific, please feel free to send in a message. I would love to hear from you! So until next time, keep on geeking! After updating the start-up script of my RPi, I discovered the pi would hang as it began the SSH server. A quick look online confirmed what I suspected, the clock script was hanging the machine. Not wanting to remove the script, I looked in to another means of working around the problem. I am by no means an expert at python and I apologise in advance if I explain this incorrectly. All you Python gurus out there, please forgive me! As I understand it, once the clock.py script is executed by init, the computer waits for the python script to finish. Somewhere along the line this is not happening. Perhaps because it is a clock script and clocks don’t have a habit of stopping unless you stop them. 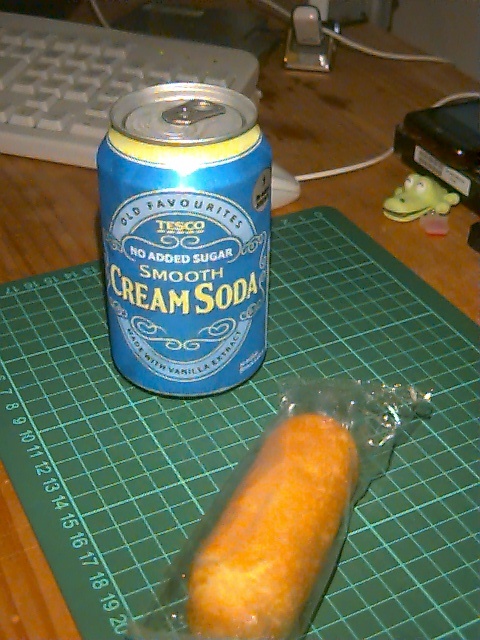 So to get the init.d script to finish you need to make the clock.py script run in the background. To do this you need to edit the clock.py, adding an “&” to the end this line. You may also wish to remove the “sudo” command, the script is executed just fine without it. 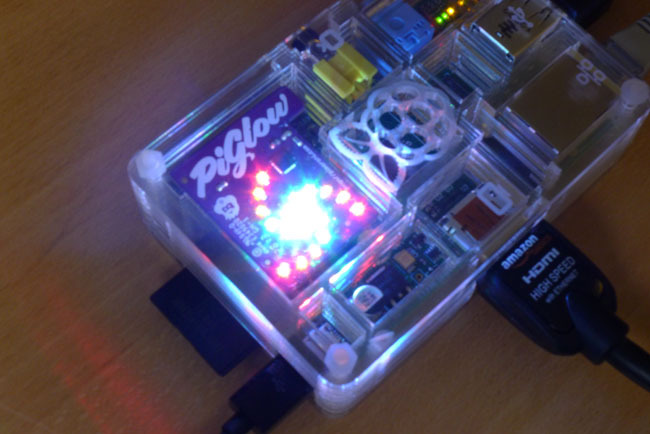 The clock.py script is awesome, it makes use of the Piglow in a practical and fun way. I really can not wait to play around with this little board and python some more. Chances are if your visiting this site, you are the sort of person who still uses what people today refer to as “retro” hardware or as my girlfriend calls prefers to call it “tat”. Among all these precious artifacts is my console collection and the first proper console I ever owned: the famous Atari VCS 2600. The granddaddy of game consoles and one of the longest supported consoles in gaming history. The 2600 served to initiate a generation of gamers into the genre well in to the 80s, even after its hardware was considered dated. The Atari 2600 holds a special place in my heart, which is why in today’s blog, I will be telling you a story with a happy ending. So recently I purchased a new singing and dancing 27” wide screen IPS LCD television, retiring the 19” Sony CRT which up until recently had been fine for our needs, that is until HD movies came along and left me squinting as I watched the film Super8 on my now relatively tiny television screen. I was less than happy about shelling out for a new set, but the picture is pretty amazing, especially the colours. Maybe the tube was going on my Sony, but on the IPS screen my DVDs are really looking a lot better. As always there was a slight snag with this particular upgrade. The Sony had been perfect for hooking up any of the old consoles I had and the picture, albeit coming through the RF aerial, was still pretty clean. So imagine my horror when I hooked up the Atari to the new flat screen and was greeted with an amazingly fuzzy picture. Perhaps RF interference wasn’t as bad 20-30 years ago, but today in 2013, the picture was pretty dire. So that left me scratching my head, there had to be a way of improving the image quality. That’s when it hit me, what about composite? The Wii was hooked up via composite and the picture was pretty good, so why could the Atari not do the same? The Internet: The Fountain Of Knowledge. I spent the best part of the evening and the next day looking online for adaptations for the Atari 2600 that would convert it from RF to composite. 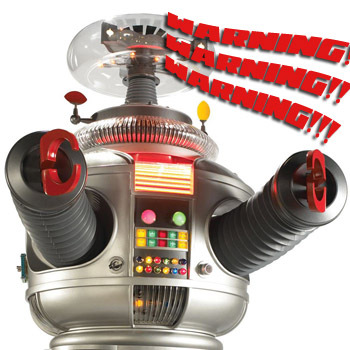 Several of the guides, while promising, also came with a warning to the would be modder. Not all 2600’s took to modification the same way. Sometimes you would get a good picture or the colours might be out, worse you might not get a picture at all. This really didn’t fill me full of confidence while I researched the mod. Even my favorite web show Ben Hack had a spin on the video mod, his included two 1k pots for adjusting the picture if the colours were out. Personally I wasn’t bothered too much by the colour, I mean seriously. I had been putting up with RF for years, the benefits of a half decent picture and not having the tune the set in where more then good enough for me. After all this is an Atari 2600 we where talking about. How sharp do you need those pixels? A square blob is still a square blob even in high def! Wire for hooking up your components. Attention: Do not attempt this modification unless you are comfortable using a soldering iron and have a reasonable grasp of electronics. Neither myself nor the original author of this hack is responsible if your Atari comes alive and tries taking over the world or worse stops working all together! Okay so that is the warning out of the way, lets get busy hacking! For me this was a really easy, straight forward hack that ended with a good result. The picture quality might not be amazing on Ms. Pacman, but on most of my other games it is pretty damn sweet. Unlike other mods that allow you to adjust them on the fly, this mod gives you a generally good picture across the board without altering the aesthetic look of your Atari console. This was the most important factor for me, all I wanted was to swap my 5-6 meter long RF cable with a composite. First of all you will want to build the circuit board that will eventually go inside your machine. For my installation of the hack, I altered the design, as I did not want a set of phono sockets on the rear of my Atari 2600. Instead I wired a 3mtr phono lead directly to the circuit board. I drew enough of the lead inside the console through the hole for the RF lead and looped a knot in the phono cable. This meant if the cable was pulled or snagged, it would not be ripped out of the console, damaging components. Alternatively you could use hot glue to secure the cable. 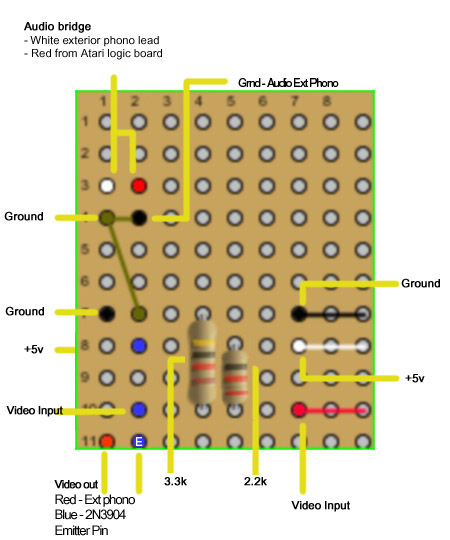 Below is the diagram for the circuit, note this is how I have it built inside my Atari. 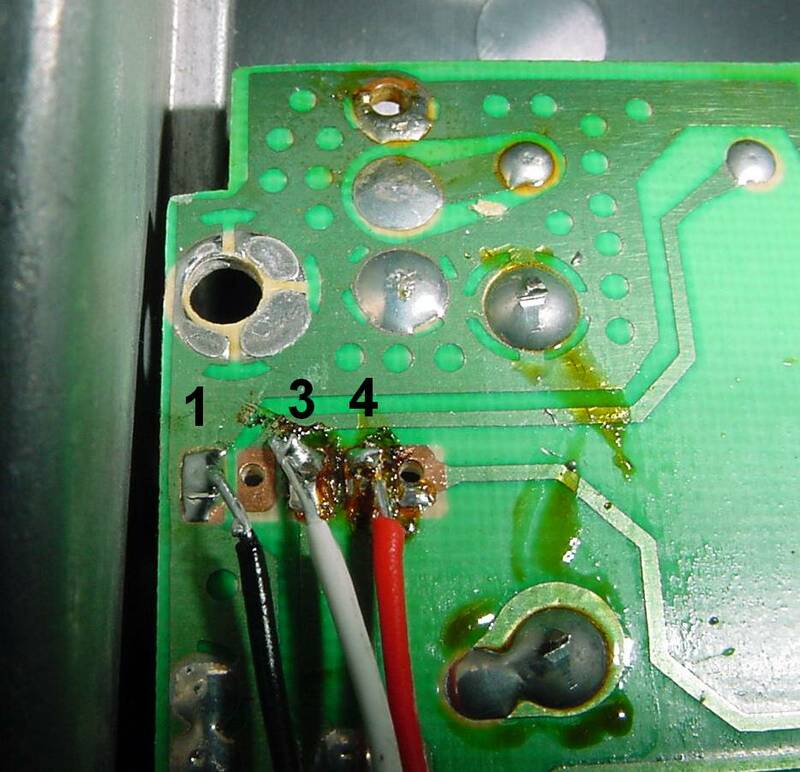 If you want phono connectors on the rear of your machine, you will need to alter the wiring slightly. It is up to you if you wish to connect wires to the board yet or connect them first to the points on the Atari. I cut 5 wires roughly 10” in length and attached them to the bread board. 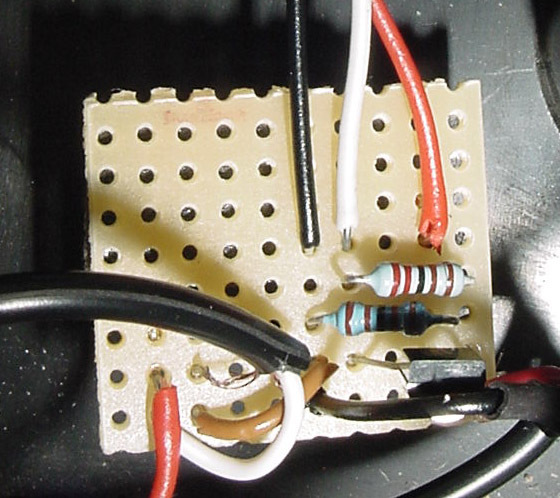 Using: Black = Ground, White = +5v, Yellow = Audio (tip: Fit your transistor so that the emitter is where the letter ‘E’ is shown on the diagram. I used an additional brown wire to route the ground to an isolated area of the bread board so that I could ground the exterior audio, as pictured below. Once you have put the circuit together you will need to take apart your 2600 and begin tapping in to contacts on the motherboard. 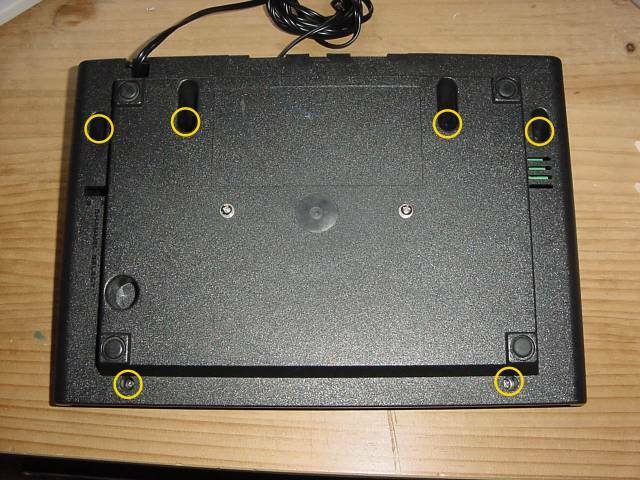 Flip the console over and remove the six screws indicated in the image. Once you have the lid removed, disconnect the cable connected to the controller board, this is the board with all the switches. With the cable disconnected, unscrew the two remaining screws that are holding the board in place. Gently lift the board out and place it to one side. 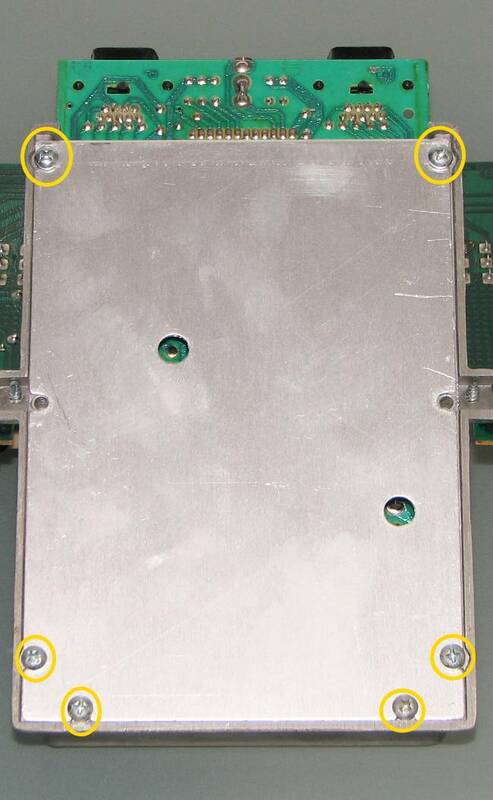 Returning to the console, you should now be left with the cartridge slot and a large metal housing. 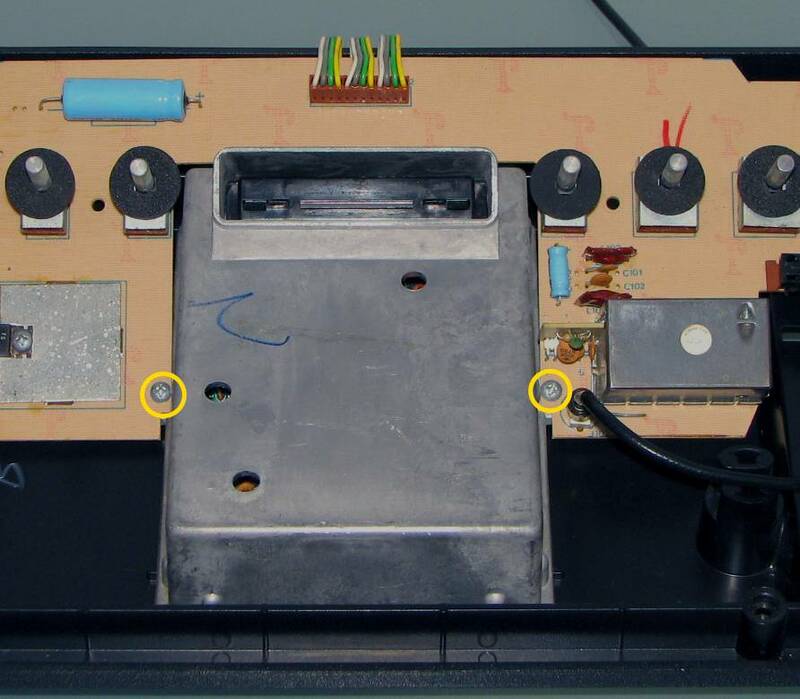 Flip the Atari over and remove the two screws as shown. The motherboard should now be free of the plastic base. Lift it out and flip it over, removing the screws indicated. 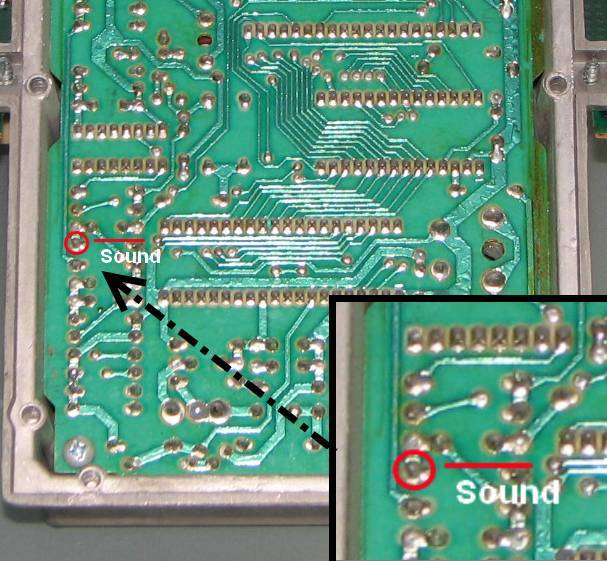 With the motherboard exposed, you need to tap into the audio line of your 2600. Solder one of the 10” red wires to the pin indicated in the photo. Replace the metal back plate, threading your red wire through one of the holes and screw the unit back together. Place it back on to the plastic base of the console and screw it in to place, making sure you use the screws with the spacers! Now that’s one down, next on to the video. Get hold of your controller board and flip it over so you can see all the pins, try and locate the RF module, use the photo as a guide. Unless you have removed you RF module, you need to solder your wires on to the rear pins of the RF module, as shown in the photo. Before you begin work on the controller board, I would like to give you a little advice. Your 2600 is roughly 25+ years old, which means the traces on the PCB are fragile. So try to be gentle with your soldering iron, don’t expose the PCB to too much heat. If possible use a fine tip, which will focus your work and make for a tidy job. As you see in the photo above, my attempt isn’t great to look at, but it does work. Will teach me to use a worn tip on my soldering iron. Fortunately this mod unlike some others, does not require you to solder directly to the TIA chip. Instead we are tapping in to the necessary lines just before they feed in to the RF modulator. Some guides recommend that you remove the RF module, this I leave entirely up to you. I left mine connected as it has been sitting there for the best part of 30 years and it seems a shame to remove it. As far as I’m aware leaving it installed does not effect our modification, but installing the mod will disable the RF module from functioning. With your wires now connected to the board, carefully place the board back inside the 2600 bottom case, fixing it down with the two screws you removed earlier. Reconnect the cable to the top of the board, reconnecting the logic board and controller board back together. Unless you did so already, solder the wires coming from the controller board to the circuit we built. Once you have done this, you should be good to go. Before applying power to the console, if you have a multimeter and know how to use it, I highly recommend you do a line test on all your soldering points. Make sure there are no crossed lines on your bread board circuit. If it all checks out okay, hook the console up to your TV and try playing a game. Hopefully it all worked and you have an Atari now working on composite. Secure all your wiring, making the inside look tidy before finally screwing the lid back in place. Now pat yourself on the back, well done!